Wait until the second half of this year, and you might be able to get a super-thin and lightweight Ultrabook for just $599. These lower-priced Ultrabooks, however, will use plastic materials for the chassis, rather than the more pricey aluminum used today. Despite their sleek and slim profiles, Ultrabooks are still a tough sell for laptop buyers because of the high prices. Current Ultrabooks have starting prices from around $800 to over $1,000--significantly higher than average Windows laptop prices of just $507 in March (per NPD/Laptop). Intel has previously said that Ultrabooks will drop to $699 by the “back-to-school” season (late summer) this year, as a result of a big marketing push. Now, Intel expects Ultrabooks to dip even lower through the use of cheaper yet sturdy type of plastic, according to a report from Focus Taiwan. The fiberglass-reinforced plastic casing materials are touted as being as rigid as the metal materials used today, as this “Chassis torsion test results” slide from Intel illustrates. Plastic laptops, however, certainly don’t feel or look as good as ones that carry an all-aluminum chassis. If Intel wants Ultrabooks to truly be seen as the “pinnacle” of mobile computing devices--capable of taking on the premium MacBook Air--PC makers might have their work cut out for them in marketing these cheaper Ultrabooks as premium or superior laptops, even if the plastic is as sturdy as metal ones. 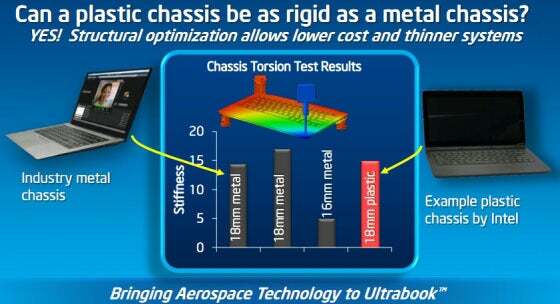 Intel suggests a possible solution that may be available in upcoming Ultrabooks: A mix of plastics and aluminum--a strong plastic frame but aluminum coating on the outside. You’ll still get a cheaper Ultrabook that’s just as strong and that looks and feels more expensive that it is.